I’m coming to the end of my second, three-month stint here in the Mill Library, and am now almost two-thirds of the way through the collection. My spreadsheet has more than doubled in size since my last blog post – it’s gone from around 12,000 entries to over 26,000 – as I’ve moved through philosophy, politics and economics to classics, religion and now literature. 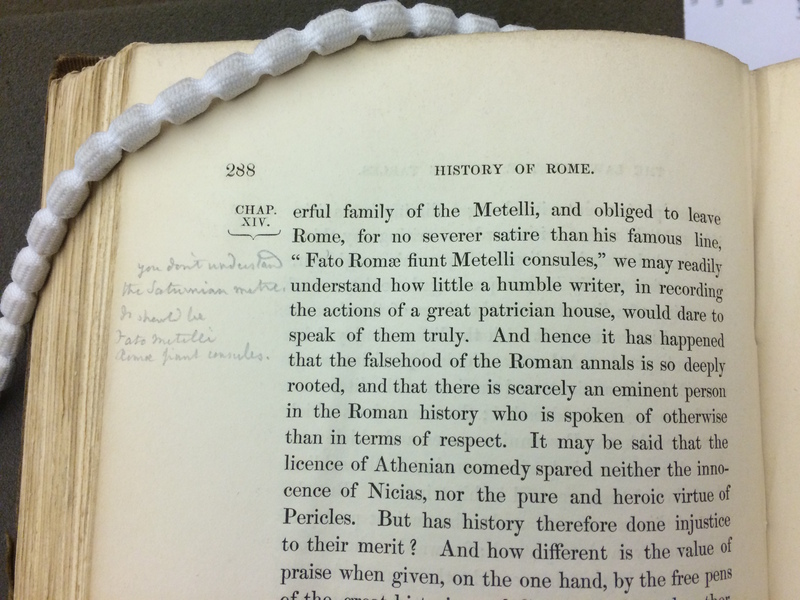 The sheer number of marks and the variety of books that they appear in continue to be surprising; we didn’t know what to expect in the classics section of the collection, for example, but there was extensive annotation in edited works of Aristotle, Plato, Ovid and Sallust, among others. These findings reinforced the impression of John Stuart Mill as a reader that we were starting to formulate from his annotations of earlier volumes. An edition of the works of Sallust from 1665, for example, is peppered with handwritten, pencilled definitions of Latin terms. We see not only Mill the tutor, but my favourite –sassy Mill, the editor and critic. He was a pernickety reader of Greek and Latin texts, frequently crossing through the printed text and offering his own interpretations and definitions of terms nearby in the margins. Inaccuracies, outlandish arguments and unsubstantiated claims transformed Mill the editor into Mill the critic. He could be extremely acerbic in his commentary on the works of others, even if – in the case of contemporaries like Thomas Carlyle or George Grote –he enjoyed a personal relationship with them. We see Mill witheringly challenging the assertions made by Thomas Arnold and George Grote in their histories of the Roman Empire and Greece, respectively. Yet, as Albert has pointed out in a previous post, there was often a stark difference between Mill’s private and public comments. For example, incredulous question marks and exclamation points noted in Edward Bulwer-Lytton’s England and the English don’t tally with Mill’s description of the work as ‘the truest [book] ever written on the social condition of England’, and the author as ‘a writer of acknowledged merit’, in an open letter in the Monthly Repository (1834). These comments not only reveal Mill the critic, but Mill the friend and colleague. They suggest that there was a clear distinction in his mind between what could be expressed in the privacy of his library, and in the more public setting of a printed review. This is a project with incredible scope for engaging scholars of earlier periods and other interests. 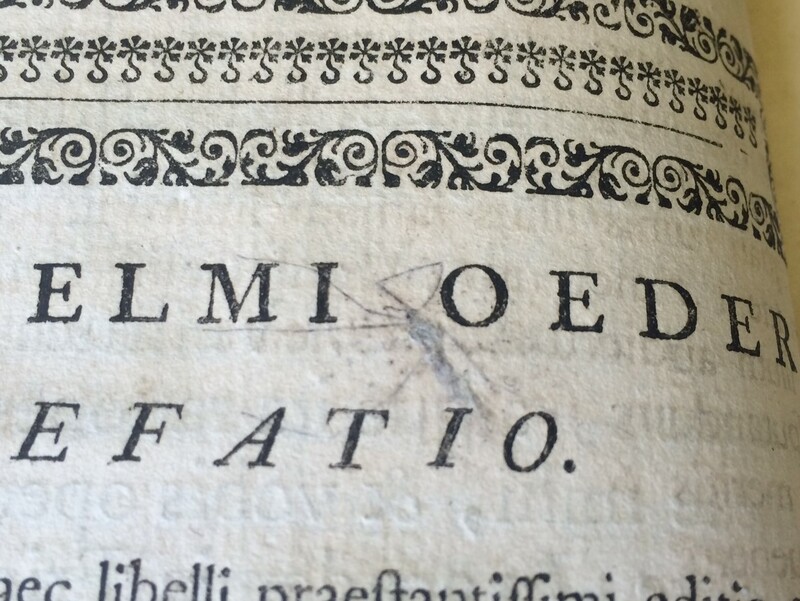 What can a crane fly, mummified in the pages of one volume, tell us of the early modern paper-making process? 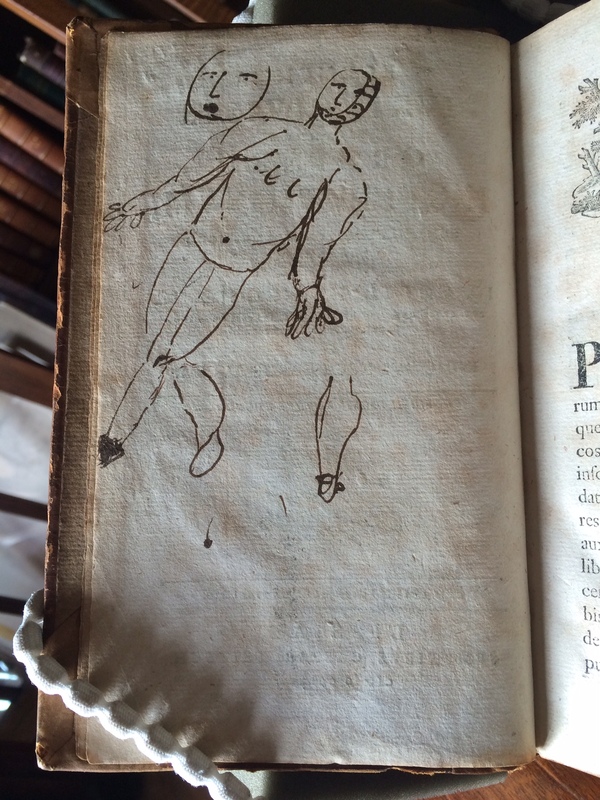 What does a reader’s crude pen sketch of a figure tell us of early modern understanding of anatomy? I’ve written here before about other traces of reading – interleaved notes, folded and uncut pages –but there is evidence to suggest that these volumes also served other functions for their readers. 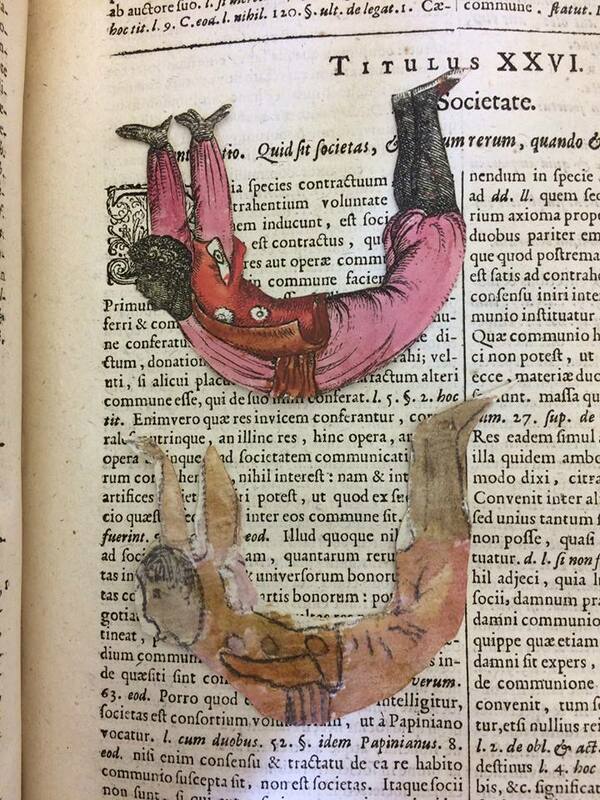 The most exciting – and mysterious – of my recent extra-textual finds are these three figures, tucked between the pages of Arnoldus Vinnius’ Institutionum Imperialium, a vast, heavy, seventeenth-century tome. The first I found were these two, who seem to be bending over backwards (someone suggested they were proof of the existence of nineteenth-century yoga!). One of them looks like it was cut out of a printed volume, and the other is a hand-drawn pencil copy. Both are coloured with watercolour. 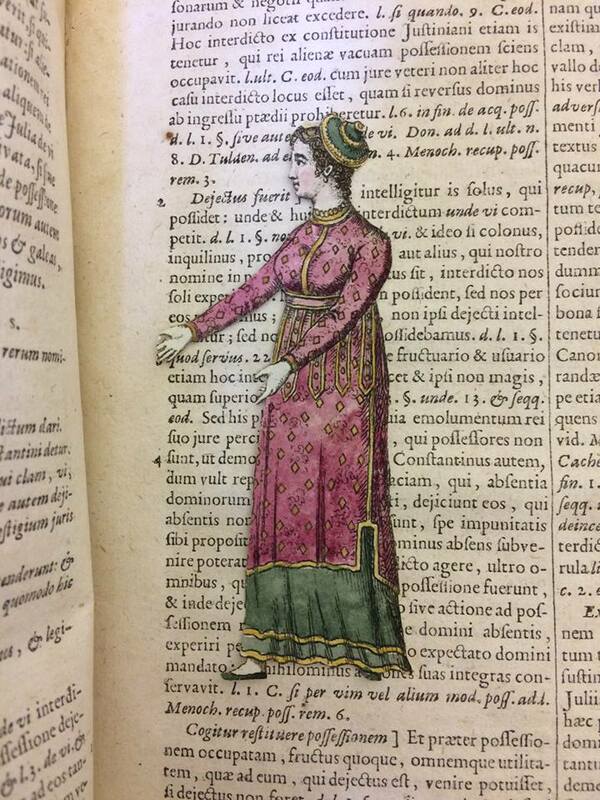 A few pages later I found the female figure, also printed and neatly painted in watercolour. They give few clues about their origin, creator, or purpose; presumably they were placed in here to keep them flat, and then forgotten about. The style and printing form would suggest early nineteenth century, and the hand on the back also looks as if it dates from around this time. Could it be John Stuart Mill’s? Are these figures evidence of a relationship between Mill and Harriet Taylor’s daughter Helen in her early childhood? Helen was born after he and Harriet Taylor met, but as far as I am aware we know little of their early relationship. At this stage, that is as far as I can go; a speculative leap that invites further research. The sheer number of volumes in the collection and marks found mean that I can’t really linger too long on any one volume, however intriguing or mysterious the findings might be. But this is really the point of the project, or at least my role in it: to find the marginalia, in order to eventually facilitate others to come up with the answers!